‘Wendy’s Wish’ is an Australian hybrid whose merit was recognised with patenting. It is now a popular plant worldwide. 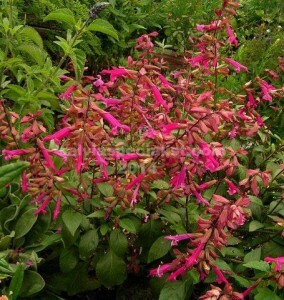 Smooth foliage is dark green and the tubular flowers are a deep pink which is easy to fit in a garden. It flowers a lot, not quite so much in very cold weather. It is generally around a metre in height but with heat and good soil could be taller. In very hot areas or very cold it will be better with a little shade. It is easy to grow from cuttings so it wouldn’t hurt to have a few in a protected place as insurance. At the time of finding ‘Wendy’s Wish’ it was not known exactly what its parents were but it has been duplicated by crossing S.splendens and S.buchananii. An accidental sport of Wendy’s Wish was noticed and cultivated, later named ‘Ember’s Wish’. This is more a red flower but also a good plant and patented. Now there is a third called ‘Love and Wishes’ (released in 2014) which is a burnt maroon colour much the same as ‘Desley’ if you know that one. ‘Desley’ is a 2m grower whereas ‘Love and Wishes’ should be around 1m so the two grown together could make a nice effect in my opinion.